One of the very best ways to protect your pet is to start off with all of the veterinary vaccinations required to keep him healthy and then continue with veterinary care in Massachusetts at your local animal hospital in Dartmouth, as well as any recommended booster vaccinations in the future. This is true of all pets, whether they are primarily indoors or outdoors. A trip to the dog park, the groomer, a stay at the local board kennel – these are all places where your pet could be exposed to contagious diseases. It is important for Dartmouth, MA pet owners to speak with their vet before taking their pet out to any of these public places or pet services. 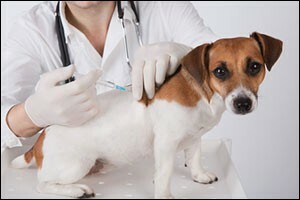 How Do Veterinary Vaccinations Work? Similar to human vaccinations, it is important to understand that a shot is not an immediate fix. It can take anywhere from a few days to a few weeks for many veterinary vaccinations to be fully effective. If you are planning on taking your dog to one of these places or services and you are behind on your vaccinations, make sure to schedule an appointment with Anchor Animal Hospital in Dartmouth as soon as possible to protect your pet. Even if you don’t have any plans on going anywhere, pets can quickly and easily slip out of the front door or the backyard and become exposed in other ways. A simple walk around the block on leash can expose your dog to many potential diseases. It is important, as a pet owner, to ensure that you are doing everything possible to protect your pet from harm. The top vaccinations that Dartmouth, MA pet owners should know about and make sure to speak with their veterinarian about are the DHPP, which stands for distemper, hepatitis, parainfluenza and parvovirus, and rabies. The DHPP vaccination is also known as the “distemper shot,” but it is important to make sure that it includes all four elements for proper protection. Rabies can be fatal to all mammals, which includes humans, so it is important to get your dog a rabies shot. In fact, many states require it by law for public safety. Other vaccinations many be given depending on where you live, what you do and your dog’s potential for exposure to other risks. Here is an overview of some of the veterinary vaccinations available through veterinary care in Massachusetts and all over the South Coast region. Again, speak with your vet to find out if these vaccinations are recommended for your pet based upon your unique situation. Bordetella – This vaccination is common for people who take their pets out and about to dog parks, kennels, doggie daycare, groomers and other places where they will come in contact with other dogs. Bordetella is a common virus that most people know as “kennel cough.” It is a very serious and extremely contagious upper respiratory infection, but it can be prevented through veterinary vaccinations. Canine Influenza – Everybody gets the flu. Canine influenza is a particularly serious viral upper respiratory disease that has spread across the country since 2004. Increased risk is associated with boarding kennels and animal shelters throughout the east coast areas. Lyme Disease – Another common concern in the northeast, Lyme Disease is a bacterial infection that is carried by ticks. Tick prevention should also be part of your veterinary care in Massachusetts, so make sure to speak to your vet at the local animal hospital in Dartmouth. Corona Virus – While more common in the southern states, there are certain areas where pet owners have become concerned about the spread of this intestinal virus. Again, if you travel or if Dartmouth, MA pet owners have concerns about exposure, speak with your trusted local vet for advice on veterinary vaccinations for this virus. Leptospirosis – Some veterinarians include this vaccination in with the distemper shot, making it a DHLPP instead of a DHPP. Risk for exposure is more common in humid or moist regions, especially places that have a lot of standing or slow-moving water. It can be transferred from pets to humans, so there is a considerable public safety risk in areas where this is common. We have talked a lot about dog veterinary vaccinations because dogs are much more likely to go to groomers and other public places with their owners. However, with many cats being outdoor animals and pet owners adopting cats from shelters where the history is unknown, it is important to learn about vaccinations for feline patients as well. Rabies shots should be given, especially for male cats and cats who spend time outdoors. The FVRCP, which stands for feline viral rhinotracheitis, calcivirus and panleukopenia, is the most common veterinary vaccinations for cats. Testing and vaccinations for feline leukemia, FIV or feline immunodeficiency virus, as well as FIP or feline infectious peritonitis, can also be given. Most house cats do not have a big risk for these diseases, but outdoor cats do. If you have questions or concerns about veterinary vaccinations, contact Anchor Animal Hospital by calling 508-996-3731. Dartmouth, MA pet owners and pet owners throughout the South Coast area have trusted the quality veterinary care in Massachusetts at Anchor since 1975. Our team can help you with regular veterinary check-ups, emergency vet care, veterinary vaccinations and much more. Please contact us today to set up an appointment or to speak with one of our qualified and experienced team members.